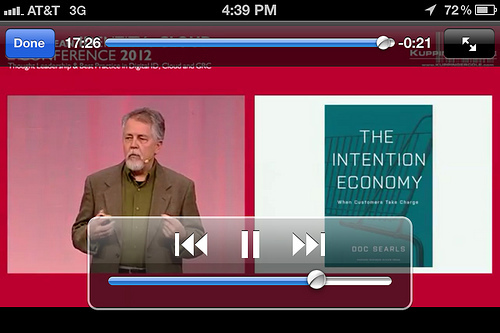 Doc Searls: The Intention Economy. used under CC license from dsearls on flickr. I just finished Doc Searls’ latest book. This book is several things, all of them good. This is a knowledgeable look at the future of being a customer in a world where the Internet realizes its potential as an information commons (instead of a storefront). The book is simultaneously about being a consumer and a customer (not exactly the same), and about big data and little data (the data you should be in control of), and about the Internet and the economy. Doc introduces a new (5 years old or so) effort to create software services that enable customers to announce to the world their intentions, and to then receive bids from vendors who wish to sell the products and services that might be some value for those intentions. This is a reversal of rules and roles which currently lock customers into the loyalty silos that companies use to corral their wallets. Every chapter in this book is a revelation on an important topic, from the coming collapse of the advertising bubble, to the need for customer-based contracts instead of the current lopsided boilerplate contracts of adhesion, to the Internet as a managed commons, which can support individuals owning their own data and negotiating with an open market for what they need: based on their own intentions, rather than from some expensive (in money and effort) algorithm devised to mine their data and ferret these out. Who knows their intentions better than the customer? The new economy, based on fourth-party brokers that act on behalf of the customer —not the vendor—will be open (newcomers welcome, no silos allowed), efficient (no more guessing intentions, transactions are knowledge-full), effective (allowing vendors to work together), and it will bring the Internet closer to its potential as a free exchange of knowledge that can also support innumerable transactions and contracts. In the end, this is also a story of a work in progress, as Doc and others have already started to build software services to explore this new economy. This is an important work, that announces what could, and I would argue, should be a new direction for an Internet enabled economy. As a bonus, the work is extraordinarily well written at the prose level, and is not simply a blog-to-book. Each chapter adds substantially to the overall argument. I cannot recommend this book too highly. I am encouraging friends and strangers alike to give it a read. I would also submit that there are corollaries to the commercial vendor/customer relationship that Doc’s logic and services would help improve. How much better would civil society be if the intentions and the capabilities of citizens, and the problems they face, were announced in this fashion to their local governments? How much more effective would continuing education be if the student could announce the skills they require to the world and have multiple offers for training? The Internet as a managed commons (Doc does a great job of advancing Lewis Hyde’s work on the commons) extends to many facets of our social interactions, not just those that involve transactions for money. Doc does talk about micro-transactions, but there are also new efforts to enable a sharing economy that would benefit greatly from these services.